We’re pleased to announce another radio station is joining our North Yorkshire multiplex. North Yorkshire Oldies will launch on the 1st February, backed by the team at Minster FM, Stray FM and Yorkshire Coast Radio. There will be a new sound on the airwaves from Monday 1st February, with the launch of North Yorkshire Oldies on the North Yorkshire DAB Multiplex. North Yorkshire Oldies is a joint initiative by three of the UKRD Group’s radio stations, Minster FM, Stray FM and Yorkshire Coast Radio. The station will play non-stop music and memories, 24 hours a day, and is promising listeners they will be never more than 60 seconds away from another great song. North Yorkshire Oldies can be heard on DAB Digital Radio in North Yorkshire, online at www.northyorkshireoldies.co.uk and via a mobile App. This entry was posted in north yorkshire on January 29, 2016 by Matt. We’re pleased to announce that Vale Radio will be launching on our North Yorkshire’s multiplex today (Monday 5th October) from 1pm. Vale Radio has already been broadcasting online, but we’re excited to have it increase its audience by broadcasting on DAB Digital Radio. This entry was posted in north yorkshire on October 5, 2015 by Matt. We’re pleased to announce that Yorkshire Coast Radio will be joining our North Yorkshire multiplex in February. Test transmissions are about to start in preparation for their formal launch on Tuesday 17th February at 8.45am. This entry was posted in north yorkshire on January 31, 2015 by Matt. Local broadcasters Harry Gration from BBC Look North and Christine Talbot from ITV Yorkshire, together with Katherine Dow Blyton who plays the part of Harriet Finch in Emmerdale, gave a big boost to nearly 700,000 radio listeners in York, Harrogate and across North Yorkshire when they pressed a big green switch, switching-on four new digital radio transmitters. The switch-on means that 81% of listeners in North Yorkshire will be able to receive their favourite local radio stations – BBC Radio York, Stray FM, and Minster FM – on DAB digital radio in time for Christmas. The big switch-on took place at The Racecourse in York. 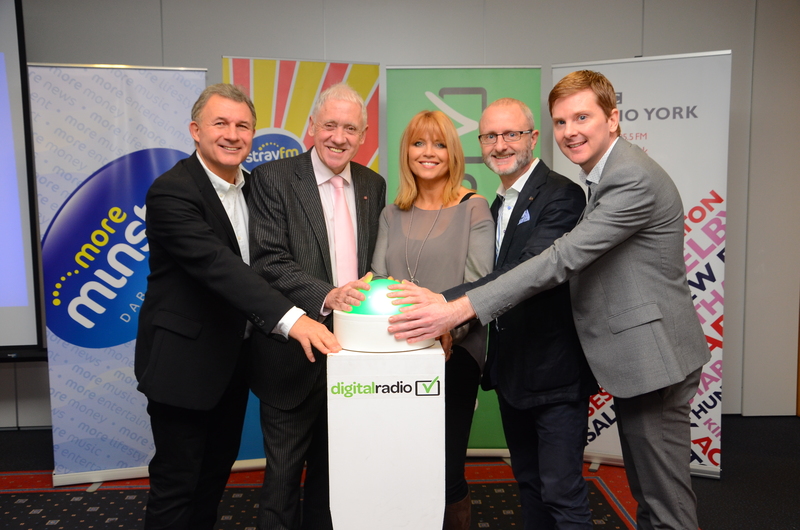 The four new transmitters launching at Bilsdale, Acklam Wold, Harrogate and Olivers Mount will bring DAB digital radio coverage for local stations from zero to over 81% of the population in the area – around 700,000 people – and they will add over 935km of roads into local DAB coverage for the first time. Almost 60% of homes (57.9%) in North Yorkshire have a DAB digital radio, and nearly 40% of radio listening hours are to digital platforms (38.5%). Until now listeners in North Yorkshire haven’t been able to receive any of their great local stations. To receive the local North Yorkshire stations on DAB listeners with digital radios may have to retune their sets. Find out more at getdigitalradio.com/retune. The switch-on comes in the run up to Christmas when 40% of radios are sold and coincides with a new digital radio advertising campaign featuring presenter and tech guru Suzi Perry which is running on BBC radio and commercial radio stations. The ads say that digital radios make perfect Christmas gifts and are available from only £30. The new transmitters are part of an industry and Government programme of work that aims to expand the coverage and listening to DAB digital radio. National BBC DAB coverage has been increased to 95% of the population and the Government, BBC and commercial radio has agreed plans to build a further 200 local DAB transmitters to extend local DAB coverage to more than 90% of the population. This will make DAB available to an additional eight million listeners across the UK and add over 6,700 km of roads into coverage. A cumulative total of over 20 million DAB digital radio sets have been sold to date in the UK. Digital radio is very popular in cars and almost 60% of new cars (58%) now come fitted with digital radio as standard (CAP/SMMT July 2014). Sanjiv Buttoo, Managing Editor of BBC Radio York said: “We’re very excited that a digital switch- on for North Yorkshire is finally taking place. Our audience tell us they’ve been waiting to hear us on DAB for some time and it will be another way of being able to listen to North Yorkshire’s only county wide station. BBC Radio York offers a rich variety of news, sport, music and personality – with programmes hosted by established presenters – which we know will be enhanced by this new service”. This entry was posted in north yorkshire on December 17, 2014 by Matt. It’s been a busy time for MuxCo as we’ve been preparing for the launch of our multiplexes in North Yorkshire and North Wales. Our North Wales multiplex is currently testing in preparation for its launch tomorrow (Friday 12th December) at the Galeri Caernarfon. We’re pleased that BBC Radio Wales, BBC Radio Cymru, Nation Radio, Nation Hits, Capital and Smooth will be broadcast from our initial two transmitters. The North Yorkshire multiplex has started limited tests, which will be ratcheting up in the coming days before the multiplex officially launches next Wednesday (17th December) from York Racecourse. Harry Gration from Look North and Christine Talbot from Calendar will join the station teams from Stray FM, Minster FM and BBC Radio York for the switch-on. This entry was posted in north wales, north yorkshire on December 11, 2014 by Matt. We had some good news last week, as Ofcom announced that MuxCo North Yorkshire Ltd had been awarded the licence for North Yorkshire. This entry was posted in north yorkshire on December 17, 2007 by Matt.